The human visual system can handle dynamic ranges that are several orders of magnitude larger than those of conventional acquisition and visualization devices. In order to fill the gap between the direct observation of a scene and its digital representation, high dynamic range sensors have recently been devised. Techniques are also used to build high-dinamics images from the output of low dinamics devices, e.g. by means of multi-esposure. Recently, a number of systems have been proposed to extend the dynamic range of current visualization devices. However, the problem is far from being well investigated. As a consequence, the dynamic range of high-dynamics images must be reduced to fit the one of the visualization device at hand. Several solutions exist for the tone mapping problem. However, most of them only cope with still images. These algorithms cannot be simply extended to video. 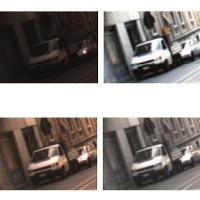 Moreover, in driving assistance applications, video processing is usually performed on low-cost hardware, with devices often embedded in the camera box itself (e.g., smart cameras). This project addresses the problem of tone mapping of high-dynamics video sequences. Special attention is put to temporal illumination variations. S. Marsi, G. Impoco, A. Ukovich, G. Ramponi, S. Carrato, Using a recursive rational filter to enhance color images. In IEEE Transactions on Instrumentation and Measurement Vol. 57 (6), pp. 1230-1236, 2008 (impact factor: 0.603). S. Marsi, G. Impoco, A. Ukovich, S. Carrato, G. Ramponi, Video Enhancement and Dynamic Range Control of HDR Sequences for Automotive Applications. In EURASIP Journal on Advances in Signal Processing Vol. 2007, 2007 (impact factor: 1.012). A. Ukovich, G. Impoco, G. Ramponi, A Tool Based on The Co-Occurrence Matrix to Measure the Performance of Dynamic Range Reduction Algorithms. In proceedings of IEEE International Workshop on Imaging Systems and Techniques, Niagara Falls, USA, 13 May, 2005. G. Impoco, A. Ukovich, G. Ramponi, Exploiting The Local Contrast to Evaluate Image Dynamics Reduction Algorithms. In proceedings of 8th COST 276 Workshop, Trondheim, Norway, 26-28 May, 2005. G. Impoco, S. Marsi, G. Ramponi, Adaptive Reduction of the Dynamics of HDR Video Sequences. In proceedings of IEEE International Conference on Imaging Processing (ICIP 05), Genova, Italy, 11-14 September, 2005. S. Marsi, G. Impoco, A. Ukovich, G. Ramponi, An Experimental Setup to Evaluate the Performance of Tone Mapping Algorithms. In proceedings of 4th Eurographics Conference - Italian Chapter, Catania, Italy, 22-24, February, 2006. Back to the research page.